1. Mix the peanut butter, 1 cup sugar and 1 egg in a bowl until combined well. Using a spoon or scoop, portion into about 1" rounds. Roll lightly in the sugar you set aside. Place on a cookie sheet and use a fork to press a cross design into the dough. 2. Bake in a 350-f oven for about 10 minutes, checking a few minutes early for browning. Let cool a few minutes then transfer to a plate. Recipe from a friend. Sharing this recipe at the following fun link parties. I make these at least once a week for my Hubby. The only thing I do different is use Splenda in place of the sugar. We totally made these when I was a kid and called them railroad tracks cookies because of the way they look on top. I know my little ones would love these, so this is a great reminder that we should make some! Wow, only 3 ingredients kinda blows my mind. Thanks for sharing what looks like a recipe my 12 year old daughter will love making. Woah. Three ingredients?? Love it! 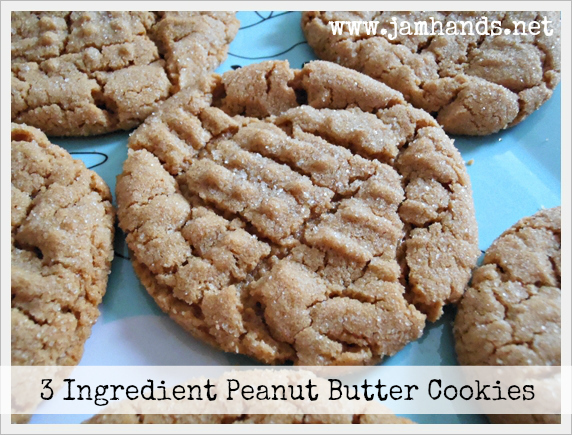 These Peanut Butter Cookies are awesome, easy and delicious. Hope you have a great weekend and thanks for sharing your tasty recipe with Full Plate Thursday. Oh my heck... these are giving me such a cookie sweet tooth! Thanks for sharing them at The Weekend re-Treat! I love this recipe! I have been contemplating making flourless peanut butter cookies sometime soon. I am trying to cut down on the wheat that I consume. Thanks for sharing at last week's Marvelous Mondays party! I will be featuring this at tonight's party. OMG! I LOVE baking and I'm so trying these this week! My mom use to make these for me as a kid and I totally forgot about them. It sounds so simple and of course these are ingredients that are on hand at all times! Loves it! Found you through Julia's link-up! 3 ingredients! Love it and love peanut butter. Peanut butter cookies are one of my favorite Christmas cookie. Thank you for sharing this. Wow I love that these only have 3 ingredients!!!! They sound delish!!!! I love these cookies. A former boyfriend's mother used to make these. Dumped him, kept the recipe. Good deal! Awesome picture! Thank you for linking with See Ya in the Gumbo--it's nice to have you. I am absolutely giddy over this recipe! 3ingredients! Yeah! I can whip these up any time and be a total hero! Thanks for sharing at One Creative Weekend! Omg! These are great! Who knew you could make delicious pb cookies w/out flour?! I now have to try & not eat the whole plate!